Before Thomas and Agnes Coomes were ever married, they were separated by World War II. From the day he was deployed 1942, until he returned home safely in 1945, Thomas and Agnes wrote to each other every day. The Coomes are the grandparents of artist Meghan Coomes, and their relationship taught her the value of the written word, its tangibility and the uniqueness of someone's penmanship. She had craved holding on to her family while traveling and working as a producer for the CMT network in 2011. When her homesickness was at an all-time high, she reached out to her grandmother in Louisville, Ky., and asked for a letter that was sent from her grandmother to her grandfather. One day, while walking through Dee's Crafts, a shop in Kentucky, Coomes spotted a piece of glass and thought, "I could turn that into something with a letter," but she wasn't yet sure what that something was. 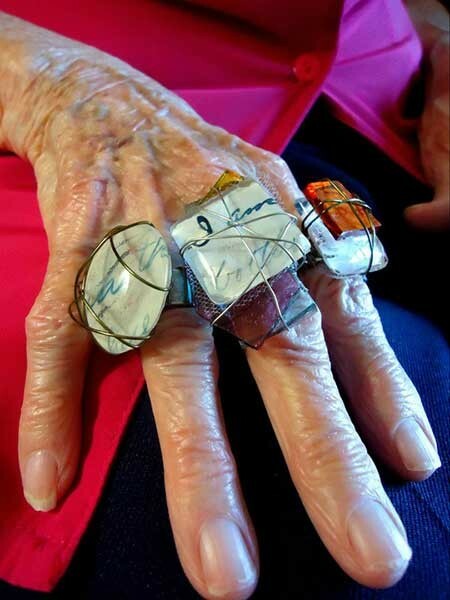 She eventually figured it out — she would turn her grandparents' love letters into jewelry. In her jewelry, Coomes uses wire, glass fragments, gems and other stones, and even kitchenware from shipwrecks to create her pieces. "It's truly a culmination of so many passions of mine: the handwritten word, family history, World War II, art," Coomes says. "I had no idea what I was getting myself into when I started it, but it's been one of the most rewarding experiences of my life." Over a glass of Prosecco at Zada Jane's Corner Cafe in Plaza Midwood, and wearing a necklace she made from a cut-out of a four-page letter her grandmother wrote during the 1940s, the 32-year-old jewelry designer, who lives and works in the neighborhood, talks about how her hobby evolved into a business. Creative Loafing: How did you start receiving attention? Coomes: Someone was like "What is that? What are you wearing?" I'm like "Oh, it's a World War II love letter." So then people started coming to me saying "Can you use my old letters, recipes, song lyrics, anything." That's when I started customizing pieces for people as well. So they can actually wear their memories and somebody's handwriting, which I think is much like a fingerprint, it can't be perfectly reproduced. I think it's special that they can wear somebody's message to you, other than just collecting dust in boxes. Is there any boutique in Charlotte that carries your stuff? No, not yet. We just moved here from Louisville last year. It's such a specific thing that it has to be a place where the person is actually gonna sell it. Otherwise, you look at it and you're like 'What the heck is that?' and you overlook it. There's a story behind it that makes it more appealing. What's the craziest thing you've ever been asked to make jewelry out of? I would say when country singer Miranda Lambert, her best friend died, who was also my ex-boyfriend — that's how he and I met, I was on a shoot doing a story about her. I told her I would make something and she wanted me to use their favorite song lyric. So I took all these letters from his mom and made that song lyric out of all of his handwriting. So that was weird. I'd never piecemealed somebody's handwriting before. It took a while because I had to make it look like it wasn't cut out. What piece has been the most special to you? Meghan Coomes’ grandmother posed for this photo before she passed away in December. My grandma actually died in December. I was living down here and I was traumatized over it because it happened pretty suddenly. I would say the most special piece would be the one that I made the day after she died. And I did that as a therapeutic thing. I just started making jewelry and a made a necklace. I read through her letters and then made that piece from a particular letter, it was a New Year's Eve letter. It talks about how my grandparents hadn't seen each other in the whole year of 1943. And I just thought about it. Now they're reunited after all these years of being apart since he died. Would your grandmother ever help you make the jewelry? No, she did not, but she would model it (see above photo). She loved seeing every piece. I cherish that photo, especially considering these are the original letters. I just love that. I just think about her hands and how aged they are and how those very hands wrote the very letters on her fingers decades and decades ago.